In early September of this year I found this plant for the first time growing in a local swamp. The specific epithet references the fact that this plant also occurs in China. There is currently an entry for this species in the Flora of China but none yet for the Flora of North America. 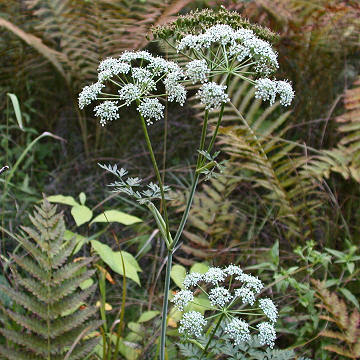 The leaves resemble Wild Carrot while the flowers look very much like Poison Hemlock (Conium maculatum). 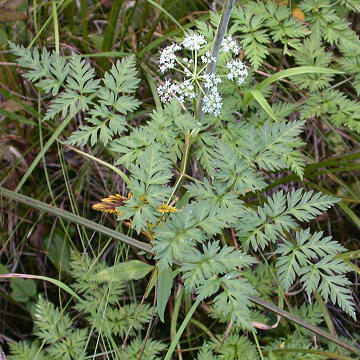 The genus is a concatenation of the latter genus and Selinum, another genus in the carrot family native to Europe and Asia. 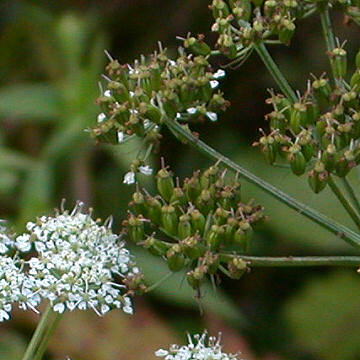 It is characterized by having flowers in a true umbel, leaves that are 2-3 compound, smooth and dorsally flattened fruit, and a cluster of fibrous roots. Mature fruit has a deeply bifid carpophore (elongated section of the receptacle between the carpels as a central axis), and conic stylopodium (enlargement of the base of the style). It grows to a height of over 30 cm at maturity. Populations appear to be secure in NY state but it is listed as endangered in several other states according to the USDA. Is this one poisonous like the Cicuta maculata I fnd everywhere? This family is fascinating and I’ve observed a few species which were difficult for me to idenify. I’ve found the C. bulbifera, the two hogweeds, the invasive(I guess) goutweed, aniseroot, Sium and a couple I can’t figure out. I get a bad case of chiggers if I hang out too long at one of the spots. I want to catch a chigger. The references that I have do not list it as poisonous or edible, so I do not know if it is toxic. It does not seem to be very common around here.